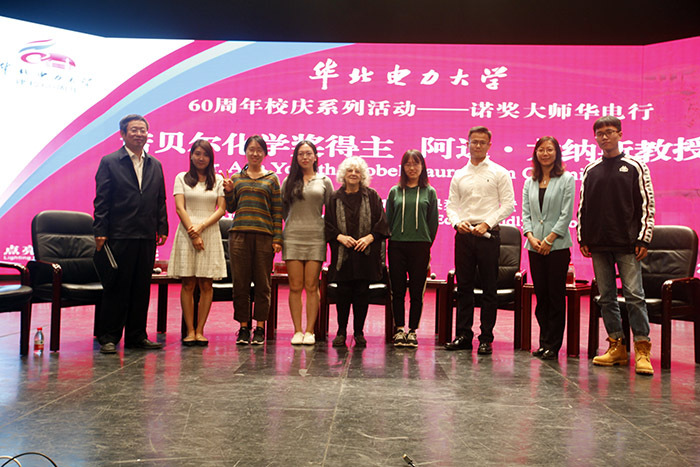 On September 27th, Dr. Ada Yonath, Nobel Laureate in Chemistry, came to North China Electric Power University (NCEPU) to attend the activity of “Nobel Laureate NCEPU Visits”, one of the series celebration activities of 60th founding anniversary of the school, giving an academic report named as Next Generation Species Specific Eco-Friendly Antibiotics. Mr. Yang Yongping, the president of our school, along with nearly 1500 teachers and students listened to Dr. Ada Yonath’s report. 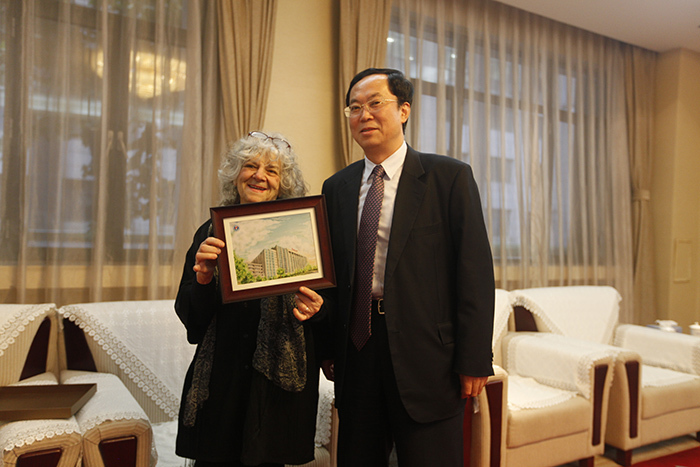 Prior to the report, President Yang interviewed with Dr. Ada Yonath. President Yang made a warm speech. He noted that Dr. Ada Yonath was known as Madame Marie Curie of Israel. Her road to endeavor was moving and encouraging. Her inspiring stories would tell us: wherever you from, whatever nationality you have, whatever skin color you are, rich or not, you could reach to the pinnacle of science only if you remain curious and persistent. The year of 2018 will be the 60th founding anniversary of North China Electric Power University. In China, a cycle of sixty years means a life cycle. In this new era of stepping into the next cycle, President Yang hopes that everyone can remain curious, enthusiastic and loyal to science, have innovative thinking, and fulfill the dream, to contribute to the prestige of the school and the great cause of humanities and sciences. Dr. Ada Yonath points out that almost all the basic functions of an organism are performed by proteins, which are products of polymerization of more than 20 amino acids. In essence, what kind of structure the organism has means its function, therefore, folding correctly helps to function, and folding incorrectly means that they cannot be used. Based on the inspiration of bear hibernation, Dr. Ada Yonath and her team used ribosomes from bacteria that survived under extreme crystallization conditions to provide a basis for further research on the synthesis of peptides on ribosomes and the extension of them into peptide chains. 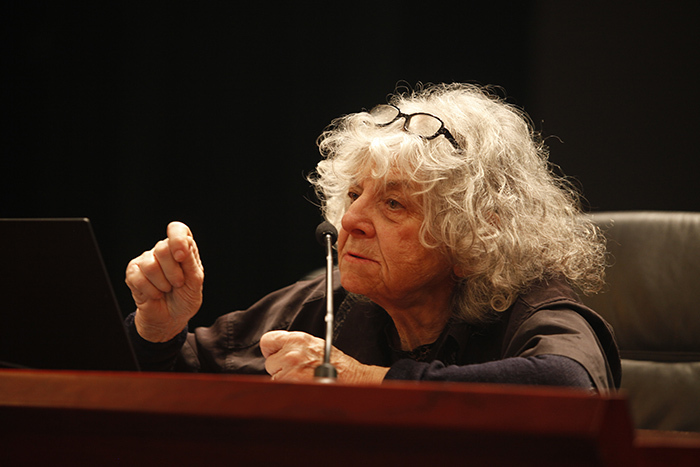 Dr. Ada Yonath, an Israeli scientist. She is a member of the United States National Academy of Sciences, the Israel Academy of Science and Humanities, the Academy of Sciences Leopoldina (Germany), the European Molecular Biology Organization, Pontifical Academy of Sciences (Vatican), and the Korean Academy of Sciences and Technology. In 2009, she was awarded the Nobel Prize in Chemistry for her studies on the structure and function of the ribosome. Her awards include the Israel Prize; Linus Pauling Award; the Albert Einstein World Award of Science; Wolf Prize; the Louisa Gross Horwitz Prize; Erice Peace Prize; The EMET Prize for Art, Science and Culture in Life Sciences and the Nobel Prize in Chemistry.